Good thing about a cold season is the abundance of citrus fruits. Oranges, mandarins, grapefruits, lemons…among them I adore this beautiful pink grapefruit. Grapefruit can add a healthy and refreshing flavor to entrees, desserts and drinks. They are high in vitamin C and a half of a medium grapefruit has only 60 calories. It is well known fruit for weight loss because grapefruit is high in enzymes that burn fats, has high water content and has less sodium. A combination of these three characteristics make grapefruit a perfect food for increasing your body’s metabolism. Not only that, lycopene, a carotenoid pigment that is responsible for the red color, is a powerful anti-cancer agent. Other benefits are fighting against common cold and fever, dissolving gallstones, boosting liver function, better digestion and enhancing immunity against infections. 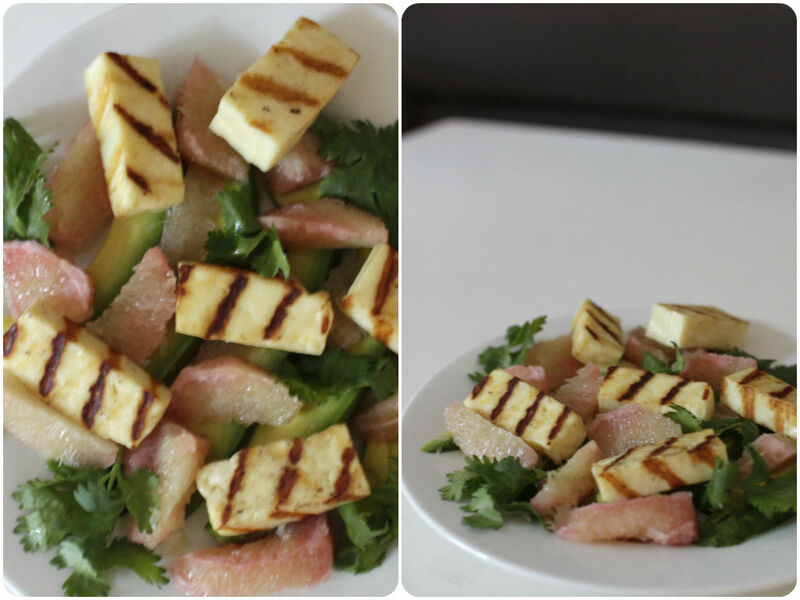 This salad is embarrassingly so simple to make with only three ingredients – the salty flavor of halloumi cheese, creamy sliced avocado and sweet-tart ruby grapefruit. It is best to serve this salad when citrus is at its best and avocados are perfectly ripe. Perhaps serve with a beautiful fish? I like adding grilled halloumi cheese here, which has the different texture when cooked – brown and crispy outside, but still soft and gooey inside. Simple dressing made of freshly squeezed grapefruit juice, olive oil and white wine vinegar brings all ingredients together. Sprinkle a good quality of sea salt on top to season. 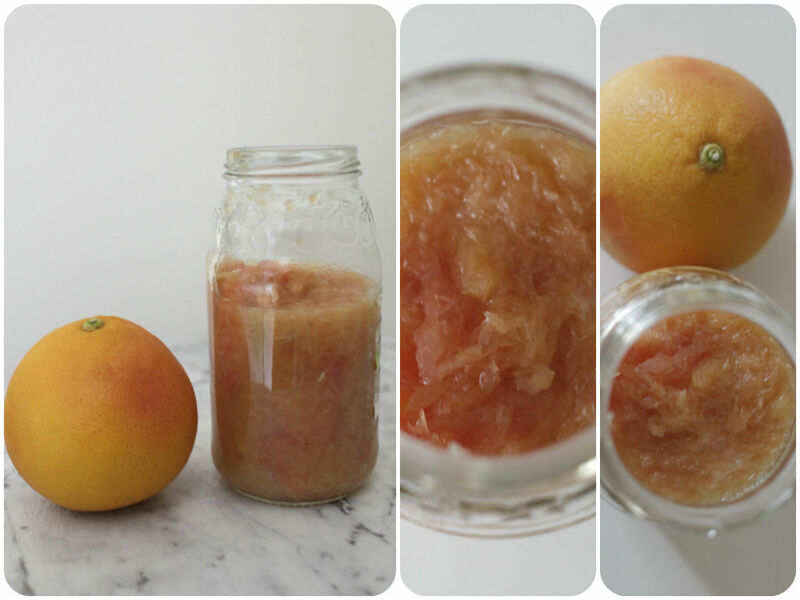 Another way of using grapefruits is preserving them in syrup. It can be used for grapefruit sweet tea, cakes, desserts such as adding on top of ice cream or panna cotta, etc. It is perfect for later use. I peeled and segmented about 5 grape fruits. As you do so, try to collect as much juice from the grapefruit into a cup as you can. Once all your fruits are segmented, place the grapefruit juice into a medium sauce pan along with maple syrup, grated ginger and a couple of sprigs of mint. Bring to a boil, stirring occasionally, for about 15-20 minutes. Then, strain out the mint leaves. Pack sterilized jars with grapefruit segments and pour the boiling syrup into the jar leaving a inch space. Cool it down completely before you put it in the fridge. I like adding a teaspoon of this syrup into my green tea, full of vitamins! Maybe use it for happy hour in gin, vodka or margarita as well?